A guttural roar spat out in Páirc Tailteann greeted Derek O'Mahoney's final whistle yesterday. It was a release of sorts for Meath supporters; too often they have seen their men threaten to deliver only to come up short. Here they came up short first and then delivered. In the first 10 minutes Meath looked out of their depth. Kildare hit 1-3 without reply and the Royals full-back line was shipping water, with each of their opposite numbers getting on the score sheet. At that point, talk of a return to the top flight looked foolish. Kildare looked every bit the bigger, more experienced team, but in the next hour they would manage just five more points. As manager Cian O'Neill would point out afterwards, things went against them. Ben McCormack was forced off through injury after hitting a quick-fire 1-1, captain Eoin Doyle followed him to the bench midway through the second-half, while a knock to the head meant goalkeeper Mark Donnellan was also withdrawn. Still, Kildare managed just one point in the second-half (a free) and O'Neill's post-match interview hinted that this week's analysis session won't be pretty. "It's very disappointing, the conditions didn't help, but one point in 35 minutes is obviously not good enough," he said. "Ultimately I think it came down to composure. We had a couple of really good chances from 15m and 20m and we didn't take either of them, and every point against the breeze when you are trying to hold on is like two points. "And that let us down, our handling of the ball and composure under pressure. To be fair Meath put a lot of pressure on us you have to give them huge credit. They were full value there today, but we are disappointed with ourselves." O'Neill pointed to their lack of composure, while Andy McEntee highlighted his side's refusal to give in. It wasn't quite the throwback to the old days when Meath turned the comeback into an art form because here, they were the dominant side after the restart. They kicked 12 wides on the day, hit the post with two more attempts, dropped three short and got nothing from a couple of goal chances. But they kept going and probing and got their rewards. On 71 minutes, and trailing by two points, full-back Conor McGill's lung-busting run saw him get behind the Kildare cover after a pass from Graham Reilly. Between himself and Shane McEntee they forced Keith Cribbin into a foul in the area. Referee O'Mahoney had no hesitation in awarding the penalty. "What I am more disappointed in is how the hell did a man get in behind the back and we weren't tracking him?" O'Neill asked afterwards. "That would be my primary concern now to be honest." Barry Dardis, who played in goal in the O'Byrne Cup and missed a penalty against Dublin in Parnell Park, stepped up. 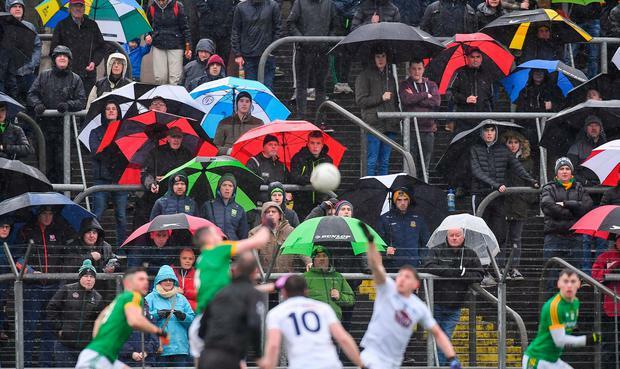 Kildare sub goalkeeper Aaron O'Neill got something on it, but the Summerhill man had hit his shot well and put Meath into the lead for the first time since Mickey Newman's point after 50 seconds. "The thing was it was either Barry or Cillian (O'Sullivan), depending on how the lads felt," McEntee said. "It takes a bit of cojones to stand up and hit a ball like that. I was just hoping... in these conditions you hit it hard and you hit it on target. But he hit it hard and he hit it in the corner, there was no stopping it, it was a fantastic penalty. "Look, it was great, great heart shown, great resilience, determination, whatever you want to call it," McEntee said. "It was such a b***h of a day out there. It would have been easy for fellas to say, look let's come back another day, but I thought they showed everything you'd like to see in a team." As it happened, both teams finished the game with 14 men. 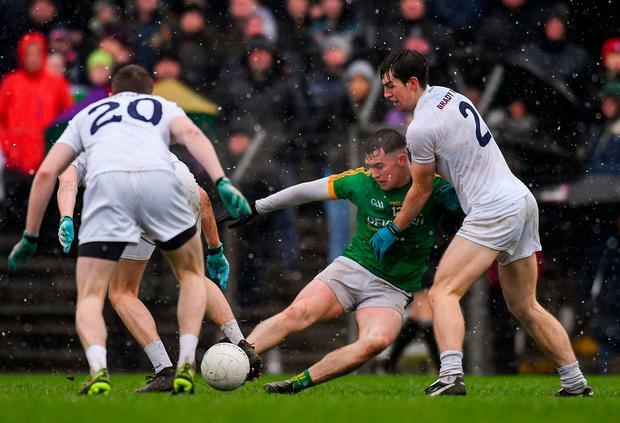 Cribbin was black carded in the concession of the late, vital penalty and Kildare had used all five subs, while Meath also lost sub Niall Kane to a broken arm in the late breathless exchanges. 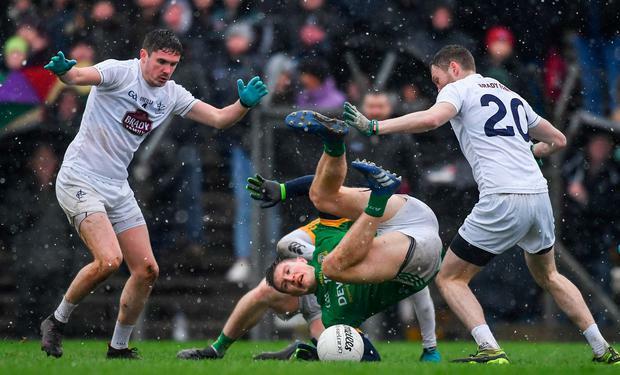 Kildare did fashion some late half-sights on goal, but didn't manage an equaliser as Meath's defence, led by the brilliant Donal Keogan, was resolute. Kildare struggled to make any inroads in the entire second-half. Along with the one point in the second-half they mustered just two wides as their five-point half-time lead slowly disappeared. "There was quite a breeze out there," McEntee explained. "You mightn't have realised it because the breeze is usually the other way around. We had 14 shots at goal in the first-half and they had nine or 10. I know they were five points up, but we missed a number of chances so it could and should have been a little bit closer. "The second-half you'd have to say showed an up in the intensity levels and the tackles and the contacts all around the pitch. It told in the end." 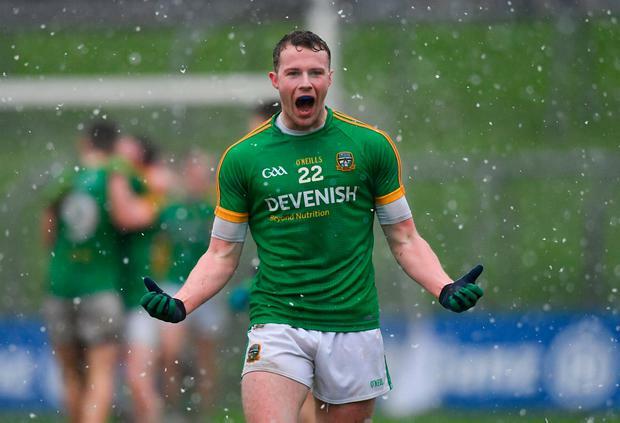 Meath held on grimly to the death and they move a little closer to a return to the top flight. Their fate lies very much in their own hands. "You win your two games and you're in Division 1, that's been our stated goal from the start. How do you win two games? You start by winning one. That's where our focus will have to switch to fairly quickly. "In this division every win is significant. Sure, there has been a bit of talk about us starting to show a little bit of consistency and I think it was hugely important that we backed that up today. Regardless of the scoreline I think it was important that we played a certain way today. "In that regard, the missed chances, while you wouldn't be happy with them, the way we were playing was the bit that pleased me all the way through. "I thought we showed heart and guts and honesty all the way through." Kildare: B McCormack 1-1, N Flynn 0-3 (1f), J Hyland (1m), K Cribbin, P Brophy, T Moolick 0-1 each. Meath - A Colgan 7; S Lavin 7, C McGill 8, R Ryan 8; G McCoy 7, D Keogan 9, S Gallagher 8; B Menton 7, S McEntee 7; C O'Sullivan 9, B Brennan 7, D Campion 8; B McMahon 7, M Newman 7, T O'Reilly 7 Subs: G Reilly 7 for McMahon, N Kane 7 for McCoy (both HT), B Dardis 7 for Newman (50), P Harnan 7 for Campion, M Burke 7 for Brennan (both 60). Kildare - M Donnellan 7; M Dempsey 7, M O'Grady 6, D Hyland 6; C O'Donoghue 7, E Doyle 7, P Kelly 7; K Feely 7, T Moolick 6; P Brophy 7, F Conway 6, K Cribbin 6; N Flynn 7, B McCormack 8, J Hyland 7 Subs: A Tyrrell 6 for McCormack (23), P Cribbin 6 for Brophy (50), J Murray 6 for Doyle (53), A O'Neill 6 for Donnellan, K O'Callaghan 6 for Conway (both 57).